The Express-1000, from left, Glonas-K and Ekran-AM satellites are on display at the Educational and Demonstration center of the Siberian State Aerospace University to mark Cosmonautics Day on April 12, 2017, in the Siberian city of Krasnoyarsk, Russia. Small satellites used for observing conditions on the earth are the fastest growing segment of the $260.5 billion global satellite industry, the Satellite Industries Association said in an annual report released on Tuesday. Small satellites, some no bigger than a shoe box, generated an 11 percent jump in annual revenue for Earth imagery in 2016 and a growing share of the 1,459 operating spacecraft that circled the planet at the end of the year, the report said. The orbital fleet includes 499 satellites that weigh up to 1,323 pounds (600 kg), many of them used for Earth observation and remote sensing, said Carissa Christensen, chief executive of Bryce Technology and Space, which wrote the report for the trade association. 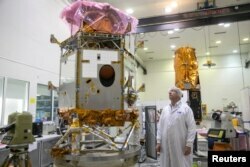 Ofer Doron, head of the Space Division of state-owned Israel Aerospace Industries, the country's biggest defence contractor, looks at a satellite in a clean room at Yahud, Israel Feb. 27, 2017. Satellite services, including home television, broadband and Earth observation services, collectively generated $127.7 billion of revenue in 2016, the biggest single piece of the industry, according to the report. Satellites used for earth imagery accounted for just $2 billion of the total industry but accounted for 11 percent of the sector's growth, according to the report. "That's expected to continue to grow, given the new companies coming into the industry," association President Tom Stroup said in an interview. The report found at least 33 dedicated small satellite launchers in development worldwide, including privately owned Rocket Lab, which debuted its Electron booster in May, and Richard Branson’s Virgin Orbit, which is expected to fly its LauncherOne rocket this year. Revenue from Earth observation services would have been higher, but the launches of many small satellites were delayed after a SpaceX Falcon 9 launch pad accident in September 2016, the report said. SpaceX, owned and operated by entrepreneur Elon Musk, returned its Falcon fleet to flight in January and has launched 10 times so far this year. In all, 126 satellites were launched last year, including 55 shoe-box-sized spacecraft known as CubeSats. About twice as many CubeSats were launched in 2015, the report said. The number of small satellite launched during the first half of 2017 already has surpassed last year's flight rate, Christensen said. In February, a single Indian Polar Satellite Launch Vehicle rocket put 103 small satellites into orbit, along with a larger Earth-imaging spacecraft called Cartosat.